Diversity and inclusion on college campuses fosters a climate of mutual respect that supports different beliefs and points of view and the open exchange of ideas. Colleges and universities need to address diversity and inclusion in meaningful ways: to create and maintain welcoming campuses where all students can succeed; to increase and retain the number of historically underrepresented and diverse students, faculty, and staff; and to prepare everyone for our diverse society. NCCJ Saint Louis has been proud to partner with most of the local colleges and universities on a variety of projects. Our FaciliTrainers have done a range of programs, from conducting guest lectures to students in courses that address diversity and inclusion to leading Building Inclusive Campuses (BIC) workshops for student leaders, resident advisors, staff members, administration, and faculty members—sometimes together in the same room, teaching and learning from one another. 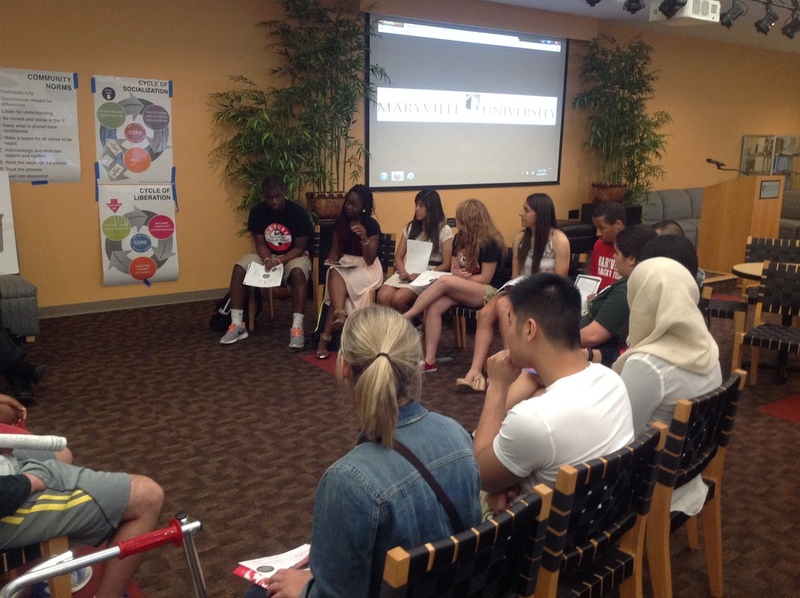 In April 2014, NCCJ completed a Building Inclusive Campuses workshop series with the Multicultural Scholars Program at Maryville University. The focus of the series was to engage student leaders in diversity and inclusion by building awareness around their experiences of privilege and oppression based on their identities. The activities presented students with new frameworks for thinking about diversity, supported them in self-reflection and sharing with one another, and challenged them to identify ways they can take action to promote inclusion on campus. Participants at a Building Inclusive Campuses workshop series with the Multicultural Scholars Program at Maryville University. The Maryville University series built awareness around experiences of privilege and oppression based on social identities.